Excess water on your landscape can cause a number of problems ranging from flooded basements to soggy lawns. If you don’t have a proper site drainage system in place, you’ll have to deal with this problem every time it rains or snows on your property. At Ivy Studio, we help you avoid the problem with excellent, tailor-made drainage solutions for your property. This is one of the best solutions to direct water towards public drains. We’ll carefully plan and create slopes and grade the surface of the land to move water away from your building. The slope ensures water doesn’t head back towards the property walls and cause basement flooding and water damage. French drains work with land grading to redirect excess water from your lawns and gardens. These drains are usually placed under the surface in trenches. The surrounding land is graded to slope towards the trenches gradually. The trenches contain gravel to filter out the dirt and direct only water to the perforated pipe underneath, which transports the water to the drains. The system is simple but effective and will keep excess water away from your property. Swales are like landscape grading but are considered an open drainage system and tend to be more obvious in your landscaping design. We’ll grade the land to slope towards a ditch with a drain at the bottom. The ditch would collect all the water and direct it towards the drains underneath, which would release it to the public drainage system. All three drainage solutions mentioned above are expensive and time-consuming. Not everyone wants to reshape their entire outdoor space to take care of small patches of soggy earth. 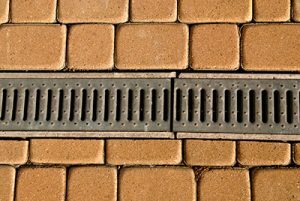 If your drainage problems are small, we can install surface drains directly in the problem areas to remove excess water. Landscape drainage needs to be planned carefully because mistakes in grading can be expensive and troublesome. Poorly graded landscapes can direct water to the neighbor’s backyard instead of the public drains. Our landscape experts will study your landscape, measure the elevation and natural topography, shoot the grade, and then draft a meticulous plan for site drainage. This ensures the end results are efficient and you don’t have to worry about water damage, soggy ground, or basement floods. The Massachusetts landscape designers at Ivy Studio can help with any front or backyard drainage services you need. We are the experts that provide comprehensive landscaping solutions. If you have questions or concerns about your current landscape drainage (or lack thereof), give us a call at 617-396-4003. Alternatively, you can also use our Start a Project form to send us details of your landscape drainage problems and we will provide you the solutions you need.